Before visiting Greece for a flying session, look up the Club Contact at our web site and find the clubs of the area in the region you are going to visit and make contact with the site manager or the expert that can give you all the useful information and of course special restrictions for the time, restrictions nearby air ports , NOTAMS , season events. hospitals ect, so as to help you planning a successful trip, permissions to fly at the various sites. They will be able to fully brief you and hopefully ensure that you will get a warm welcome and some beautiful flying experience! Their indications must not be disregarded! An IPPI-Card and a national license is mandatory for all foreign pilots. Minimum ratings are Parapro stage 3 for unsupervised flying and stage 4 for cross-country flights. With lower stages, flying is allowed under the supervision of a certified instructor. Tandem-flights may be only made by pilots in possession of a valid Greek Tandem-License or a respective permit from the Hellenic Airsports Federation. In Greece, all pilots must carry a rescue-parachute. Guest pilots are permitted to fly equipment satisfying the current airworthiness requirements and regulations of their homeland but always according to the suggestions of the manufacturer. It is mandatory for your safety to contact with the locals for flying near aifields and airports. 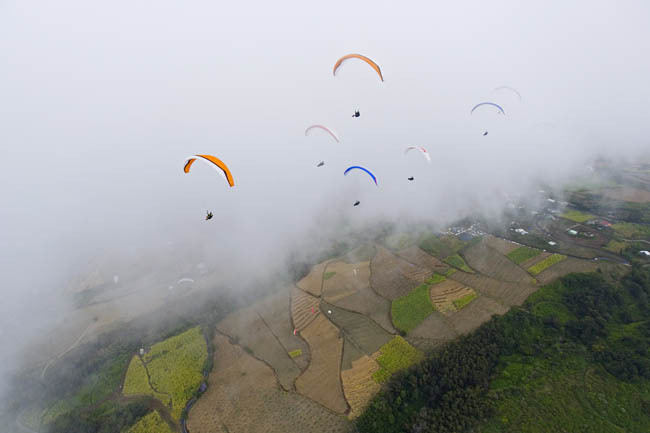 Any paragliding activity is prohibited within 10NM from airports without special premissions. No flying without a reserve parachute. Cross country flying requires a rating equivalent to FAI SafePro- 4or 5/ParaPro-4 or 5, FAI IPPI-4 or 5. If you are unsure of the conditions, local regulations, private property status or where the best places to launch and land are, contact a local paragliding club or a pro for assistance. An overview of the Greek clubs and Registered schools can be found on our webpage. Motor driven aircraft must always give way to paragliders and hanggliders. When flying on a collision course near a slope: The pilot who has the slope on the left must give way to the right. The first pilot to enter a thermal, determines the direction of rotation: All other pilots joining later must circle in the same direction. If during thermaling a glider is ascending faster than the one higher, the pilot of the higher glider must allow the lower one to ascend safely by leaving the thermaling course. Tandem gliders must be given priority. Flying in clouds is not allowed. During landing procedure priority must be given to the glider with lower altitude. We wish you many pleasant flights in Greece.